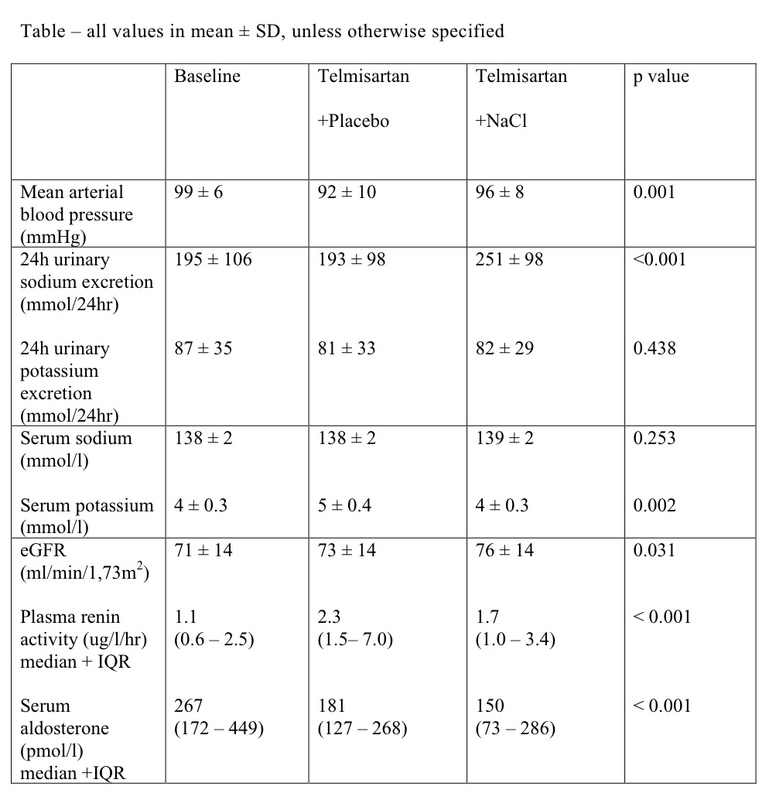 We examined the effect of dietary sodium chloride (NaCl) supplementation on estimated glomerular filtration rate (eGFR), mean arterial blood pressure (MAP), plasma renin activity (PRA) and serum aldosterone in hypertensive patients with type 2 diabetes. In a randomised, double blind, controlled study (RCT), patients with type 2 diabetes (n=28), treated with 40mg of telmisartan (angiotensin II receptor blocker) received two weeks of placebo or NaCl capsules (100mmol/24hr). Following a washout period, the protocol was repeated such that those randomised to NaCl received placebo and vice versa, allowing subjects to act as their own controls. 24h urinary sodium excretion (24hUNa), ambulatory blood pressure monitoring and blood tests were performed following each phase to determine eGFR, MAP, PRA and serum aldosterone. eGFR was determined using the CKD-EPI formula. Repeated one-way ANOVA was performed to assess the effects of NaCl versus placebo supplementation. NaCl supplementation significantly increased eGFR and MAP, but reduced PRA and serum aldosterone in the presence of angiotensin II receptor antagonists (Table). Taken in conjunction with previous cross sectional studies demonstrating increased RAAS activity with low 24hUNa in patients with diabetes, the results from this RCT demonstrate a reduction in RAAS activity following NaCl supplementation, with no evidence of adverse effects on eGFR in the short-term.